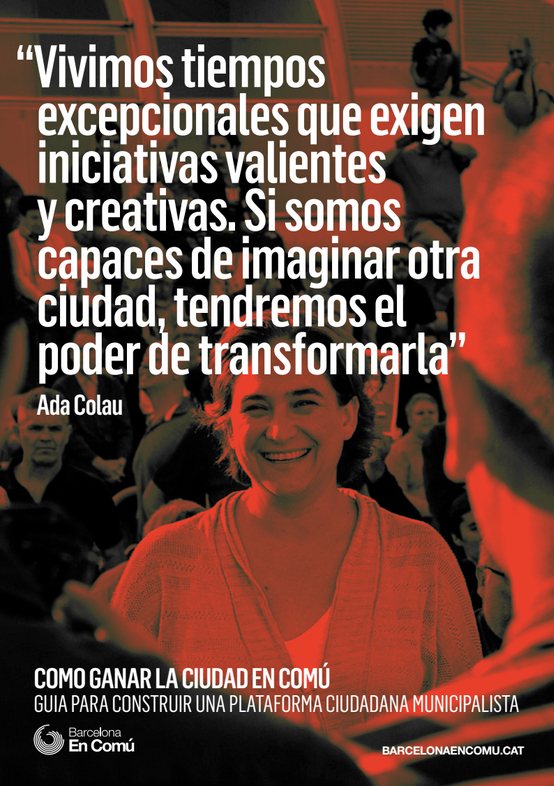 On 24 May 2015, against all the odds, the citizen platform Barcelona en Comú won the Barcelona municipal elections and former housing activist, Ada Colau, became the city’s first woman mayor. Similar citizen platforms were catapulted into office in cities across the Spanish state, from Zaragoza to Madrid to Coruña. Since the election, Barcelona en Comú has been inundated with messages from activists in cities all over the world asking the same question: how did you do it?. That’s why Barcelona en Comú is publishing “How to win back the city en comú” to mark its first year in office. The guide, drawn up by the platform’s International Committee, aims to explain the origins, philosophy, and strategies of the new municipalist movement in the Spanish state to activists in cities around the world. The publication forms part of Barcelona en Comú’s mission to support the construction of a network of ‘rebel cities’ to transform Europe from below. The platform hopes that ‘How to win back the city en comú’ will contribute to the global conversation on the city as a space of rights and democracy, and municipalism as a tool to radicalize democracy. “We know that there are many similar initiatives to our own in other cities that aim to break apart the current political and economic regime from below. Each city will have to find its own way, whether it takes the electoral route or not. Nevertheless, having won the Barcelona elections, we are excited to publish this guide to the philosophy and organization of Barcelona en Comú from our launch to our entry into government. We hope that it will be useful in the construction of citizen platforms that aim to win local elections around the world.” How to win back the city en comú. “Around the globe, activists are taking inspiration from the work and success of Barcelona en Comú. They have demonstrated that politics can be done in a new way, with social movements driving municipal change from the bottom up. This guide will be a welcome source of information about how the achievements of Barcelona en Comú can be adapted to the efforts of municipal activists in the US and elsewhere.” Bob Master, Co-Chair of the Working Families Party, New York. “Barcelona en Comú inspired many of the discussions in Massa Critica’s public debate “#decidelacittà” (decide the city) in Naples: How can we move beyond old forms of politics? How can we think the forms and languages of politics anew and govern from below? This guide will help to strengthen revolutionary municipalism in the South of Europe.” Mauro Pinto, Massa Critica, Naples. “Take Back The City welcomes this very timely guide to ‘winning the city’ from Barcelona en Comú. BComú and its sister organisations across Spain have been deeply inspirational to all of us in cities across Europe, like TBTC in London, who want to take back our cities for ordinary people.” Glyn Rhys, Take Back the City, London. The guide is available in English and Spanish and will be translated into more languages over the coming months. El 24 de Mayo del 2015, contra todo pronóstico, la plataforma ciudadana Barcelona en Comú ganó las elecciones municipales en Barcelona y la activista del derecho a la vivienda, Ada Colau, se convirtió en la primera alcaldesa de la ciudad. Otras plataformas parecidas fueron catapultados al gobierno en ciudades en todo el estado, de Zaragoza a Madrid o Coruña. Desde las elecciones, Barcelona en Comú ha estado inundado con mensajes de activistas de ciudades en todo el mundo, todos haciéndonos la misma pregunta: ¿Cómo lo habéis hecho? Es por eso que Barcelona en Comú publica “Como ganar la ciudad en Comú” para celebrar su primer año en el gobierno, La guía, elaborada por la Comisión Internacional de la plataforma, busca explicar los orígenes, filosofía y estrategias del nuevo movimiento municipalista del Estado Español a activistas alrededor del mundo. La publicación forma parte de la estrategia de Barcelona en Comú para apoyar la construcción de una red de ‘ciudades rebeldes’ para transformar Europa desde abajo. La plataforma espera que Como ganar la ciudad en comú contribuya a la conversación global sobre la ciudad como espacio de derechos y democracia, y el municipalismo como herramienta de radicalización democrática. “Alrededor del mundo, activistas se están inspirando en el trabajo y el éxito de Barcelona en Comú. Han demostrado que se puede hacer política de otra manera, con los movimientos sociales impulsando el cambio desde abajo. Esta guia será una fuente de información bienvenida sobre cómo los logros de Barcelona en Comú se podrán adaptar a los esfuerzos de activistas en los Estados Unidos y otros lugares.” Bob Master, Co-Presidente del Partido de Familias Trabajadoras, Nueva York. “Barcelona en Comú inspiró muchas de los intercambios en el debate público #Decideacitta” (decide la ciudad) en Nápoles. ¿Cómo podemos ir más allá de las viejas formas de hacer política? ¿Cómo podemos repensar las formas y lenguaje de la política y gobernar desde abajo? Esta guía servirá a fortalecer el municipalismo revolucionario en el Sur de Europa.” Mauro Pinto, Massa Critica, Nápoles.